An Egyptian government report issued in May 2011 said that 18 people per day were killed in road accidents in 2009 alone. 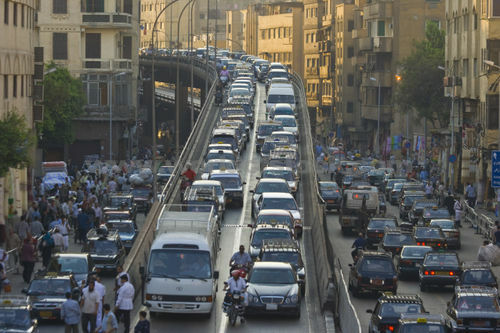 Many expatriates drive themselves in Cairo but many also opt to employ a driver. Traffic in Cairo is heavy and parking close to your desired destination can be difficult at times. For this reason many expatriates, women especially, employ a driver who can drop them off, find a parking space and pick them up again when requested. This leaves your time in the car free to do other things like make calls, send texts or just listen to some good music while reading a book. However – this must be said…. Roads in Egypt can be hazardous, especially at night, beyond and on the outskirts of major cities. Vehicles frequently travel at night at high speeds and without headlights. Traffic regulations are frequently ignored. The minimum age to drive in Egypt is 18; however drivers must be 25 years of age or over to rent a vehicle. TIP: An international driving license and insurance is required for all vehicles. Local law states that after 6 months in country, all drivers must be in possession of locally issued driving documents. This may require taking a driving test. Drivers should also employ extreme caution while operating a vehicle during or after rain. Road surfaces become extremely slippery and localized flooding can occur.